Apply now to reserve your place in Oslo, Norway. GENERAL LOCATION: Oslo, Norway’s capital, sits on the southern coast, at the head of the Oslofjord. Bergen, Norway’s major western seaport, is in the heart of the fjords. FOCUS: We immerse ourselves in the music and culture of Norway’s largest cities to provide deep and accurate print, online and multimedia reporting. New this year, public relations students will have opportunities for customized instruction and multimedia production in Norway. COOPERATING UNIVERSITIES: Henderson State University, University of Jamestown, University of North Carolina Asheville. MEDIA PARTNER: High Plains Reader. When summer dawns, Norwegians draw back their blinds, open their doors, breathe in the fresh air and head onto the streets to ROCK! The land of the Vikings is home to major international music festivals, an abundance of venues, the birthplace of Black Metal and so much more. Oslo is the perfect setting for journalists, photojournalists, graphic artists, and other storytellers, no matter the medium, to practice working an international music and culture beat. Also, Norwegian language students can hone their language skills as an interpreter, working alongside our journalists and designers. As a student in the Rock Journalism program, you will have a one-of-a-kind experience. You will be a true music and culture journalist, spending your days learning about the music scene, language and culture, experiencing it firsthand at night. From the moment you land to the day you leave, your immersion reporting will put you in front of major national and international stars, local talent searching for their break and an ocean of unique and interesting fans, supporters, producers, technicians, promoters and more. Similarly, PR students will gain an appreciation for digital storytelling as a project process, and distinguish between the role of reporter and public relations practitioner, particularly in the music industry. Logan Harle (front) and Angie Perez exit the pit after photographing Wilco at the Norwegian Wood Festival. 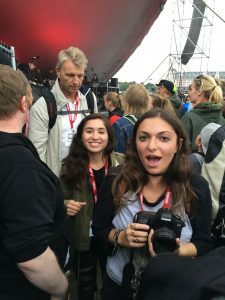 In 2016-2018, our student journalists covered the citywide Oslo Musikkfest, 12 hours that featured 400 bands across the city: Muse at Telenor Arena; Ozzie and Alice at Tons of Rock Festival; Wilco and Israel Nash at Norwegian Wood; Tom Jones and Travis at Over Oslo Festival; Silvana Imam at Oslo Pride Fest; Ghost at Bergen Fest; local artists at venues and squats; and countless artists, musicians, critics and regulars of the scene. But it’s not just the music – there is so much more to Norway. Our reporters interviewed refugees, the Norwegian filmmaker behind the documentary “Drone,” residents of squat houses, tattoo artists, Christian revivalists in a predominantly Atheist country, LGBTQ activists, street artists, politicians, a tour company owner who has brought more than 120 groups of American Norwegians to the homeland, the Norwegian ambassador to Bulgaria, athletes, fishermen, chefs, shop owners, American families meeting their ancestral families for the first time … and the list goes on. Yet they barely scratched the surface. Led by veteran journalists, photojournalists and educators, in partnership with the Fargo-based High Plains Reader, you will produce real stories, photos and multimedia for a U.S. and international audience. The Oslo ROCKS! program aims to jump-start your career by offering you real experience covering the world stage. All of our student work can be found at http://www.oslorocks.com and at the High Plains Reader. If it’s not the music or the storytelling that is driving you to think about a trip to Norway, maybe it’s the language and culture. Our program is headquartered at the premiere Norwegian language school in Oslo, and for four weeks we will be surrounded by top educators in the field. If you are interested in honing your Norwegian language skills while immersed in the culture, this will be the perfect trip for you. As a Norwegian interpreting student, you will receive language instruction from Alfaskolen and assist our journalism students in their research and interviewing. Join our team and help us continue to tell the stories of the greatest music city in Europe. 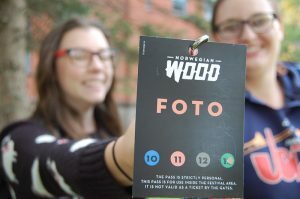 A student holding a pass to the Norwegian Wood Rock Festival. Oslo, the capital of Norway, sits on the country’s southern coast, at the head of the Oslofjord, and is known for its expansive green spaces and museums. Many of these are on the Bygdøy peninsula, including the Norwegian Maritime Museum; the Vikingskipshuset, with ships from the 10th century; and the Norsk Folkemuseum, with artifacts from Sami and Viking cultures. Other attractions include the Munch Museum; the Oslo Opera House; Holmenkollbakken, the site of the Olympic ski jump; fjord tours; the Nobel Peace Center; the royal palace and so much more. Supporting us in and around Oslo will be the Alfaskolen language school, officially recognized by Vox, the Norwegian Agency for Lifelong Learning. Alfaskolen will provide interpreters and language and culture instruction. If you’re already a student of Norwegian language, you’ll have the opportunity to practice more advanced skills. If you’re new to the language, you’ll learn enough to survive and work successfully with interpreters. Many Norwegians speak English, so it’s an excellent opportunity to hone your international journalism skills in a friendly environment. Students will have secure suite-style housing in or near Oslo city center. Typical housing units will sleep four students and have one bathroom, a kitchenette, a commons area and free Wi-Fi. Students must bring their own mobile phones, laptop computers, DSLR cameras, SD cards, voice recorders (or smart phone) and personal reporting material. If you don’t have these items, please discuss technology options with the program director. The program will provide some specialized equipment as needed. The Oslo ROCKS! program is open to undergraduate and graduate students and interns, as well as post-graduate interns, non-traditional students, professionals and experienced travelers looking for a unique experience. Undergraduate students will receive three credits and a grade from our partner institution, Henderson State University. The credits are transferable, and we will help you get them accepted at your university for upper-division credits or graduate credits in journalism, communication or electives prior to the trip. 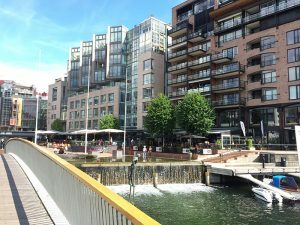 Aker Brygge – the popular entertainment and shopping area. Steve Listopad (Program Director) is an assistant professor of media at Henderson State University and a Ph.D. candidate at North Dakota State University. He has taught journalism and media in China (2013); Nice, France (2014); Florence, Italy (2015); and Oslo (2016 and 2017). Before teaching, Listopad worked for New Line Cinema in Los Angeles, and he reported for a daily newspaper, an alternative weekly newspaper and a military newspaper. Curt Chandler (ieiMedia multimedia senior faculty) teaches multimedia reporting and journalism entrepreneurship at Penn State University. He has more than 25 years of industry experience as a visual journalist, writer and manager. Chandler was the editor for online innovation at post-gazette.com in Pittsburgh and taught photojournalism at Duquesne University before becoming a full-time educator in 2007. He has coached student journalists doing field work in Brazil and Hong Kong. He conducted the first multimedia workshop for the Vatican press corps in Rome. He is a video coach for the National Press Photographers Association and the Online News Association. Sonya DiPalma, Ph.D., (public relations faculty) is an associate professor of mass communication at the University of North Carolina Asheville, where she teaches Multimedia Storytelling, Strategic Communication, Social Media & Fundraising and Environmental Communication. Sonya is a 2015 ieiMedia Faculty Fellow, a 2015 AEJMC Ginger Rudeseal Carter Miller Teacher of the Year recipient and a 2011 fellow with the Plank Center for Leadership in Public Relations. As an accredited member of PRSA, she worked as a communications director for 14 years prior to transitioning to academia. View complete faculty biographies on our Oslo Faculty Page. Apply now to reserve your place in the Oslo ROCKS! Project. Or contact Program Director Steven Listopad at: steve.listopad@ieimedia.com, 701-261-5562. Students must fill out the online application and include contact information for two references using the “Apply Now” link. A $100 application fee is required with the application but will be applied in full to your program fees or refunded if you are not accepted into the program. Application deadline: March 1, 2019.